At last, it can be revealed - Norfolk's part in the Da Vinci Code. I knew that something mysterious was going on here as soon as we arrived; from the south, St Andrew appears to be a normal, if over-restored, 14th century church, but the north side has been comprehensively redeveloped to give it the appearance of some kind of nightmarish institution. 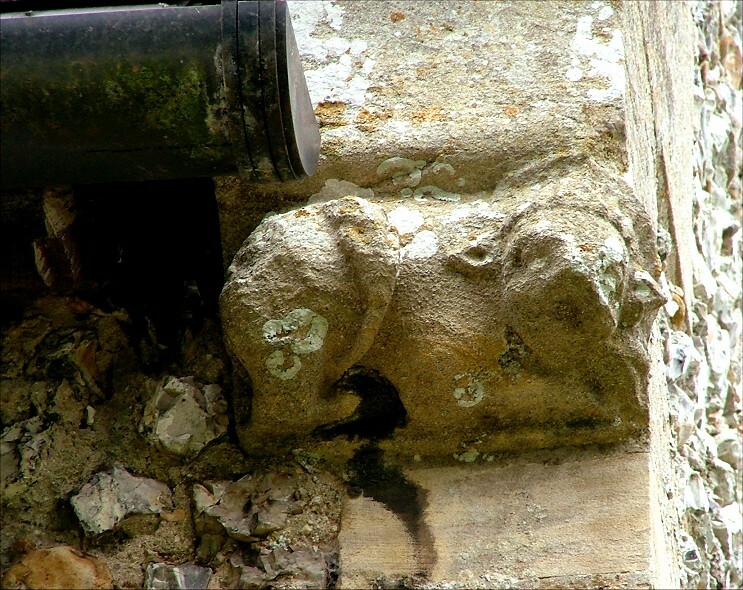 Huge, angry grotesques guard the guttering, and the tower beyond is like that of a Scottish baronial castle. A massive chimney in the north-east corner completes the effect, giving the whole piece the look of a lunatic asylum. And here's something even stranger. St Andrew was locked. 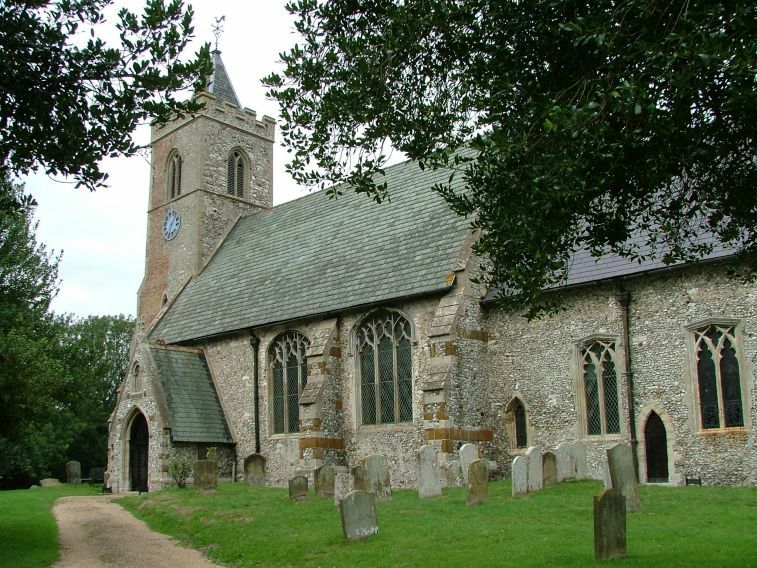 Now, this is near impossible; here on the outskirts of Hunstanton, we are at the heart of the greatest concentration of open medieval churches in northern Europe. Every other single medieval church for miles and miles, hundreds and hundreds of them, is kept open for business, welcoming to strangers and pilgrims alike. It seemed impossible that, deep within this area, there should be a renegade, and so I assumed that it was a mistake. Not so, apparently. 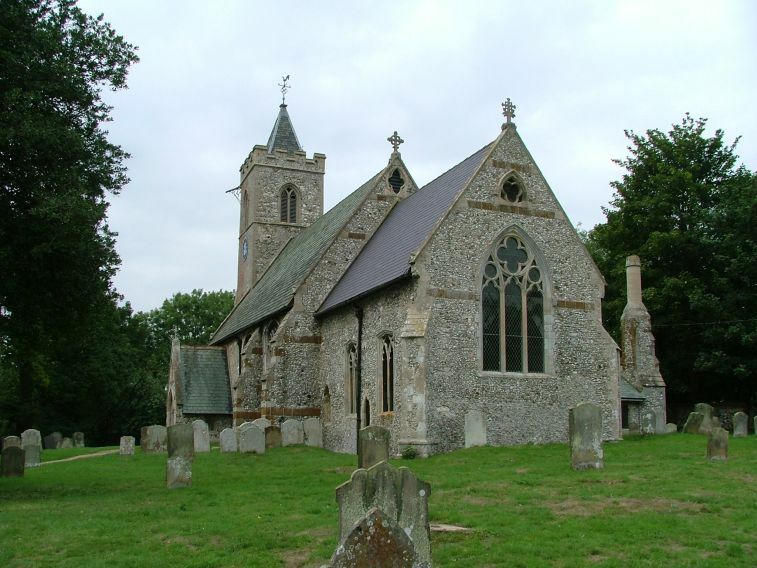 Peter, who was with me, assured me that he had never found this church open, and several other church explorers have also mentioned to me that they have yet to see inside the walls of Ringstead church. Now, some people might suggest that the PCC responsible for running such a church must be inhospitable, or unfriendly, or unhelpful, or disinterested, or suspicious, or unenthusiastic, or ungenerous, or thoughtless, or mean-spirited, or lacking in energy, or rude, or incompetent, or even downright lazy. But not me. I would like to be charitable, and offer an alternative solution. 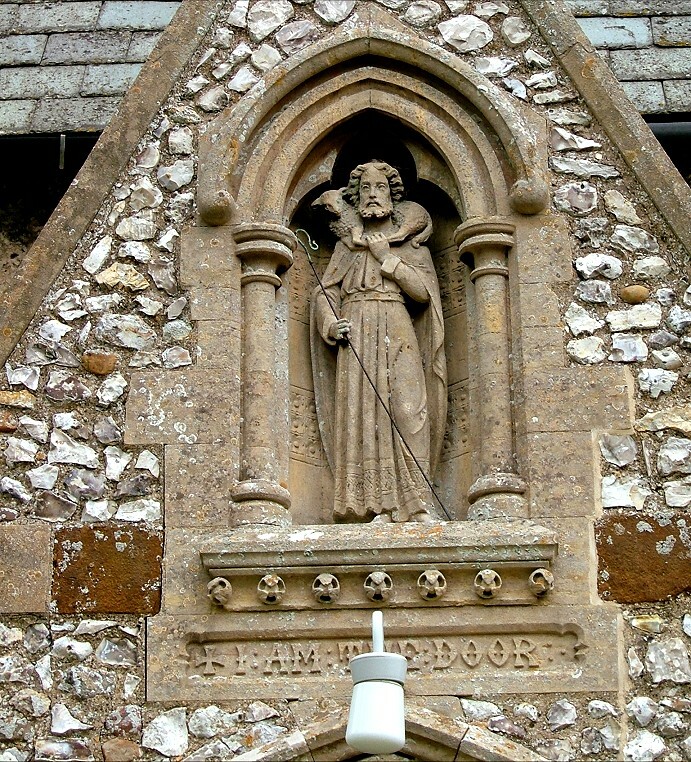 Above the locked gates of the rather ugly south porch is a massive 19th century niche with a statue in it depicting Christ as the Good Shepherd. It isn't done well - Christ looks bored, or fed up, and the lamb looks as if it is struggling to escape - but I had been looking at it for a few moments when I noticed the inscription. In large letters beneath Christ's feet it reads I AM THE DOOR. Of course! Now, I have not actually read the Da Vinci Code - I reached about page 12 before I realised that it was the biggest pile of nonsense I had picked up in months, and my time would be better spent in doing something useful like cutting my toe-nails - but I had read enough to know that we should all be looking for secret signs. And perhaps this was one of them! Now, it may be that the 19th century restorers of St Andrew had put up this inscription to remind passers-by that Ringstead church is the House of God, and that His home was always to be open to those seeking Him. However, I do not think this can be the case, for why now would the Parish of Ringstead go out its way to lock God's people out of His house? I was sure that Peter and I had stumbled on something mysterious, something that would knock Dan Brown's poppycock into the shadows. We looked up at it, wondering. Presumably, you climbed to the niche and did something to the statue to open the door. What could it be? A twist of the lamb's ears, perhaps? What we needed, of course, was a ladder. We wandered round behind the tower - which, incidentally, is most curious, the entire western side of it rebuilt in brick at some point - and there it was, a tall ladder leaning against one of the buttresses. It wasn't locked to anything, it was just leaning there. 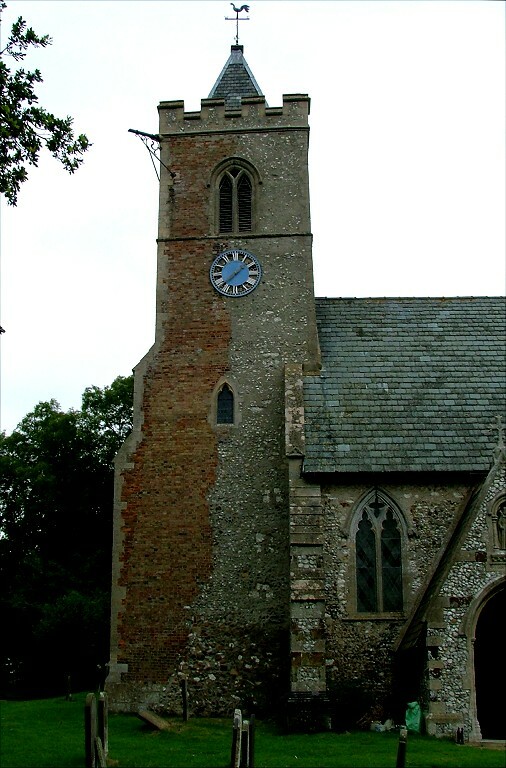 This was too unlikely to be a coincidence, that the only church for miles around which is kept locked should also carelessly leave a ladder behind the tower. Nobody obsessed with security could be that stupid. 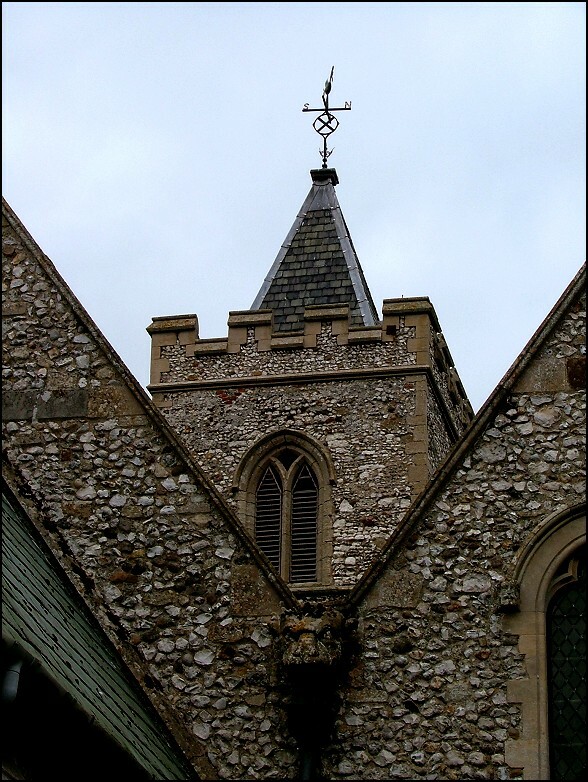 No, I imagined north-west Norfolk's Freemasons meeting up here after dark, hauling the ladder around to the porch, and using the secret entrance through the niche. Peter was all for taking the ladder and giving it a go, but I did not want to get into trouble. The thing was, if we were caught, was there not a danger that someone might think that I, too, was a Freemason? As a Catholic, I am banned on the point of excommunication from becoming a Freemason. Because of this, I am unable to imagine what shadowy activities such people might get up to once entry was gained. If it was me, of course, I would be wandering around like the saddo I am, photographing the font and the pulpit, and enjoying Frederick Preedy's east window, which I am told by Mortlock depicts St Andrew and St Peter holding the former churches of Great and Little Ringstead. I might even say a prayer or two. No doubt the Freemasons eschew these excitements for drinking toasts to Dan Brown and sacrificing goats on the altar. It's a funny old world. 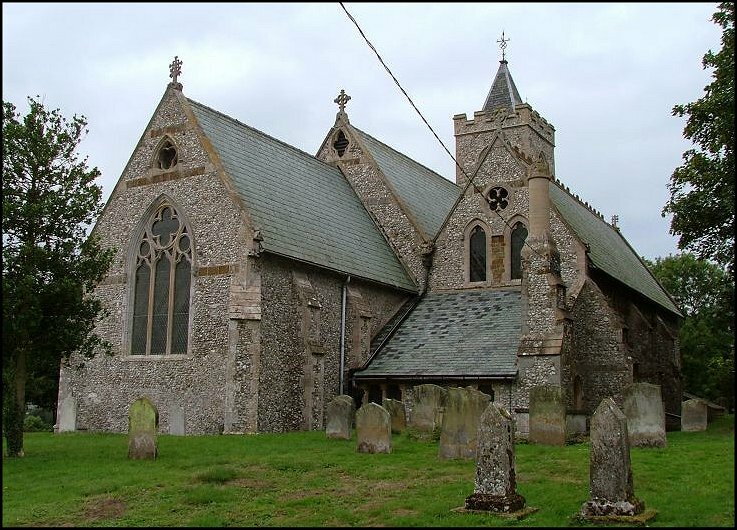 Postscript: the parish webmaster for Ringstead has asked me to indicate that this article about Ringstead St Andrew is not in any way endorsed by the parish.